It is well known that Japan has disputes with its neighbors such as Korea and China as to the understanding and evaluation of history. Of course, the most difficult part concerns the modern history where Japan tried to catch up with the West and in doing so caused intolerable sufferings to its neighbors. The government and people of Japan feel very sorry for this and express their apology on various occasions. Nevertheless, Japanese people perceive that our neighbors - hopefully not all of them - do not find our apology enough. It is very unfortunate that freedom of speech allows in Japan also ultra-conservative people to express their opinion and justify the pre-war history. I understand Koreans and Chinese are irritated and angry at such people, because I am also desperately angry with them. I hope, our neighbors understand that the vast majority of the Japanese people are also against them. On the other hand, I am afraid that our neighbors tend to neglect or flatly deny any positive element of the Japanese policy even after WWII, to demand continuous apology from Japan and to rule out any rational discussion on the outstanding issues including territorial and geographical issues on the grounds that they are the product of the Japanese imperialism. Such an attitude may entail a backlash on the Japanese side and frustrate even the vast majority of moderate and sensible people in Japan. This can lead to a sort of vicious circle and we have to stop it in any case. Therefore, I welcome the joint historical research by experts from Japan-China and Japan-Korea. Though we have not yet reached satisfactory agreements, it is necessary to continue such dialogues. The key to the amicable solution of historical issues is definitely the good human relations. Unless we have good relations now, we cannot solve the problems of past. In this relation I am happy to note that we have significantly improved our relations with Korea in this century. It is a result of joint hosting of the Soccer World Cup in 2002, Hallyu (Korea Fever resulted from the popularity of Korean TV dramas) boom in Japan and increase of tourists in both directions. Now, I am optimistic about the future of our relations with Korea. Our history dispute with China is more or less limited to the modern age, while it goes further into the past with Korea. If we look back the history, Japan and Korea experienced two armed conflicts in the 14th and 17th century and they still adversely affect the mutual perception. The first one was the campaign led by Toyotomi Hideyoshi (1536-1598) after his unification of Japan. Nowadays, Japanese people accept that the campaign was an invasion into Korea and caused lots of sufferings of Koreans. If Koreans realize this change of perception among Japanese people, little trouble will be left over in the future. On the other hand, most Koreans do not know that two invasions of Mongolians into Japan (1274 and 1281) were planned and executed on the strong recommendation by a Korean king. Battleships were built by Koreans and Korean soldiers constituted a major part of the invading troops. Therefore, Koreans should also recognize their responsibility for the Japanese victims. However, these two issues can be somehow under control and are not fatal to the friendly neighborhood, I believe. An usual map to describe Far East around the end of 5th century. Kuyakannkoku and Kaya are Japanese pronunciations. Kuyakankoku was referred to by Sanguo Zhi in the context of describing Wa in the mid 3rd century. Why do we argue even over ancient history? The last group of disputes between Japan and Korea relates to the ancient history and I would like to treat it here a bit more extensively. The argument used to center on the existence of "Minama Nihon-fu"(*). This terminology was used in Nihon-Shoki(**) Nihon-Shoki was edited - as I explain later - in the time when Japan tried to firmly lay the foundation of the country and descriptions in the text are biased by the necessity among others to impress the new Japan to China. The Japanese imperial government also saw the necessity to justify its occupation and rule of Korea from 1910. Therefore it exaggerated the contents of Nihon-Shoki and insisted that Japan ruled a vast area of southern Korea through Minama Nihon-fu. Therefore, though "Minama Nihon-fu" is a topic of ancient history, it is directly linked to the Japan Korea relation in the 20th century. It is not easy to decide how to translate "fu", because its nature is the essence of disputes. One possibility might be "Japanese Office in Minama". The first official history book of Japan and it was finished in 720. The residue of this interpretation remained after WWII and I for example learned in the school that the triangular area between Baekje and Silla - the area indicated as Kaja on the map - was called as Minama and governed by Japan through Minama Nihon-fu till it was defeated by Silla in 562. On the other hand Koreans flatly deny the rule by Wa over any territory on the Korean peninsula and the existence of Minama Nihon-fu on the ground that it is a representative colonialistic view of history fabricated by Japan and with that all influence of Japan on the Korean peninsula in the ancient time. I think I can understand their mentality very well. However, the primary materials in Korea and China also endorse the existence of Minama in the southern part of the Korean peninsula and the special Japanese influence in this area. Before going into details I would like to make my reservation to the debates which had been conducted between Japan and Korea. I mean the past arguments were too much biased by nationalistic sentiments, namely whether "Japan" ruled a part of the present "Korean" territory or whether "Japan" obeyed "Korea" or the other way round. I think such ideas are totally nonsense, because both Japan and Korea emerged as unified country around the end of the seventh century and there were no countries corresponding to the present political entities before that. We should see the history before the unification from a cooler and wiser viewpoint and accurately analyze the common cradle from where both our countries were grown up, should not we? It is generally assumed that a unified nation was formed in Japan in the fourth century with the Kinki region as its nucleus. However, the political entity on the present Japanese archipelago was still very lose and not yet called Japan but Wa. It was the end of the 7th century when people started to consider renaming its country and the new name "Nippon" or "Nihon" was accepted by Wu Zetian, Empress Regent of China, in 702(*). European words for Nippon such as Japan, Giappone and Japonsko were derived from the Chinese pronunciation of Nippon written with Chinese characters. (*) Therefore, the naming of Nihon-fu, which should have existed till 562, does not correspond to the reality, because in that time the country name Nihon did not exist. It was obviously created by the editors of Nihon-Shoki by the year 720. Likewise the word "Korea" was derived from the earlier Kingdom of Goryeo (918 and 1392). However, the Korean Peninsula was unified under the preceding dynasty "Silla" (356-935) in 675 and Korean as a nation country started to develop from that time onward. It was no coincidence that both Japan and Korea achieved their political unification in the late seventh century. Tan (618-907) was established shortly before as a superpower in the Far East and started its military expansion. Among the three countries which had existed on the Korean peninsula before the unification, Baekje was destroyed in 660 and Goguryeo in 668. The trial of Wa together with the ex-Baekje people to re-establish Baekje was completely crashed in 663 by Tang and its ally Silla. Under such situation, it is natural that Wa and even Silla found it necessary to defend their independence from Tan's invasion. The external pressure prompted the formation of political integration both in Japan and Korea and the end of the seventh century marked the birth of national identity in both countries. However, what was before that? What was before Japan and Korea? Thereafter, Japan did not fight any war against foreign countries till the Mongolian invasion in 1274. During this time Japanese people developed their national feeling. The deep involvement of Wa in the political relations on the Korean Peninsula is endorsed also by a contemporary Korean source, the stele of King Gwanggaeto (374-412) of Goguryeo (37 BC-668) erected by his son in 414. It says; "Wa came across the sea (in 391), defeated Baekje, Minama and Silla and made them vassals" and "Wa invaded into Daifang area (present Seoul area) and was repelled". This ornament is characteristic to Yamato and believed to decorate shield. the "north coast of Wa", namely "Kuja Kankoku", after some 7000 li travel from Daifang Commandery. Koreans deny this interpretation and say that Wa people only lived on the present Japanese territory. But, the editors of Sanguo appear to have thought that people could reach the north most part of Wa overland. Such and other similar information make it plausible that Wa people lived on the both coasts of the Korean Straight at least in the second and third century and later the central part of Wa came to reside on the present Japanese side. I have to add that Kaya and Japan are known since long to have a common myth of descending gods for the establishment of their state. In this conjunction some interesting archeological discoveries were made recently. The research of the graves of Kaya(*) kings progressed significantly and the strong relations between them and Wa were witnessed through a large quantity of identical articles including such "tomoe" shaped ornaments, lots of iron ingot and so on. In total 13 zenpo-koen-fun ( front-square-rear-round grave mound) exist in along Yeongsangang river. 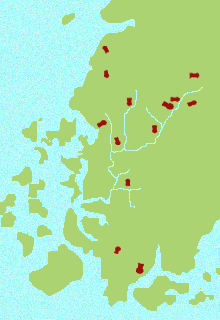 If we turn to the south-western corner of the peninsula, as many as 13 grave mounds in Japan specific front-square-rear-round form were discovered since 1991. Scholars identified the age of their construction between the mid -fifth century and the mid-sixth century. 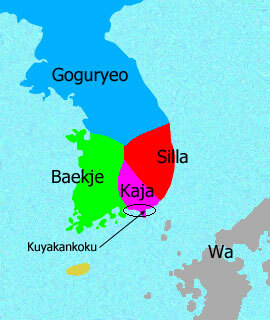 The area was under the Kaya influence, before Baekje moved south to include this area under its rule at the end of the 5th century. Various interpretations are possible as to the nature of graves. But, this is anyhow an evidence of close relation between this area and Wa. "Kuya Kankoku" in the third century became later "Kaya" or "Kinkan kaya". It was probably also called "Minama". Kaya or Minama can also mean the wider territory. If I see the inside of present Japan in the ancient time, political institutions were obviously formed not by the native Jomon(*) people but by immigrants from the Asian continent who gradually penetrated into North-Kyushu and along Setonaikai Sea - "the Japanese Mediterranean sea" - into the Kinki area(**). I believe that it is not correct to assume that native Japanese people made use of the intellectual capability of immigrants, but ruling people of Japan including imperial family are essentially of continental origin, whether they came earlier or later. Also the recent generic analyses support such understanding. Then, the special cultural and political relation between Wa and Kaya should be also underlined. Jomon people were native inhabitants on the archipelago and created the Japanese Neolithic culture (12000BC-500BC). Professor Hanihara Kazuo (1927-2004) introduced the theory of dual structure of the Japanese people. His theory was later endorsed by numerous studies including various gene researches. Present Emperor once publicly explained that Emperor Kammu (737-806), who moved capital to Kyoto in 794, was born from a princess of Baekje, descendent of King Muryeong (462-523) and this made him feel special connection to Korea. After the defeat against Tang and Silla, many members of Baekje's royal family and other intellectuals fled to Japan and participated in the building of unified Japan. I have to add that the people who were involved in the establishment of Nippon were not only descendents of Baekje people, but also those of Silla and other areas as well as people from China. Nihon-Shoki was edited in the earlier stage by native Chinese people, for example. Without native Chinese people the Japanese government could not prepare formal documents in Chinese. A delegation of Sui even discovered in 608 on a Japanese coast a city state established by Chinese immigrants. I believe, the people from different ethnic groups were living on the Korean peninsula as well as on the Japanese archipelago in the first centuries after Christ and they all contributed to the creation of both Korea on the peninsula and Japan on the islands. During such process the name Wa was attributed to the emerging political integration on the Japanese islands, which was however made not only by the original Wa people but many other people from different ethnic origins, and those who remained on the peninsula gradually lost their identity as Wa and became a part of the unified Korea. Therefore, I believe, it is nonsense to see the old history as rivalry between Korea and Japan. It started only recently to review the ancient Far Eastern history from wider perspectives and I am curious what fruits the cooperative study of scholars from Japan, Korea, China and other countries would produce in the future for the deeper mutual understandings of the people in Far East.